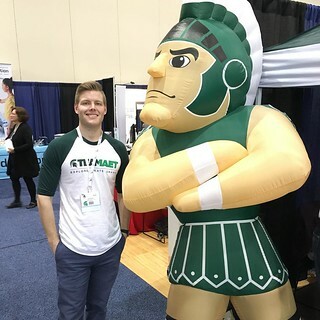 Last week I had the honor of attending the MACUL (Michigan Association for Computer Users in Learning) Conference in Grand Rapids, Michigan. This was my first year attending the MACUL conference, and after years of anticipation I can happily say I was not disappointed. I have never experienced a more inspirational, motivating, thought provoking group of educators in my career. The state of Michigan has an exceptional educational community, and this was on exhibit for three days in mid-March. First I have to thank the MAET (Master of Arts in Educational Technology) program at Michigan State University. I had the honor of sharing my experience with those who stopped by our booth in the exhibitor hall, and having some “maker” fun in the process. I always enjoy talking with people about the amazing opportunities provided through the MAET program, but this was one of my favorite of such opportunities. We helped visitors create mini-circuits on their badges, allowing them to power a small LED light and add a little creativity. This is a small taste of an activity in the program’s CEP 811 class, and I had a blast sharing it with our guests. 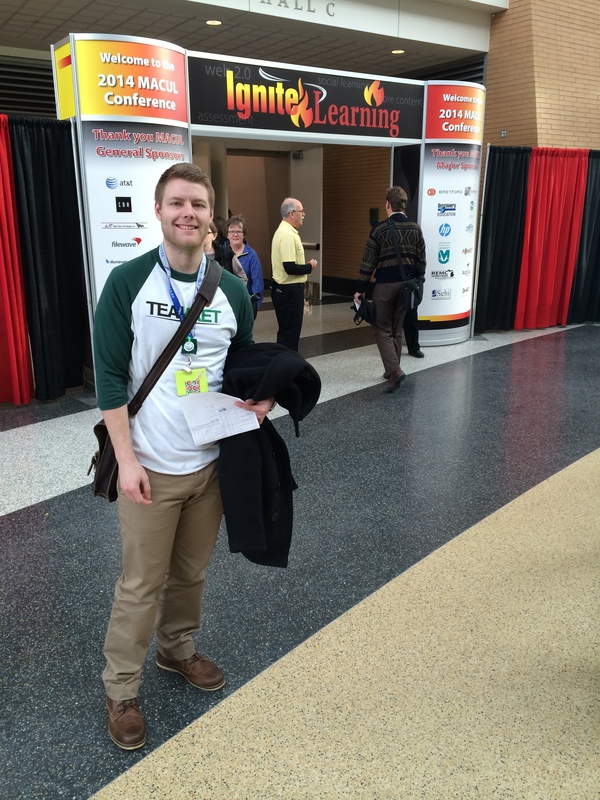 Outside of the Exhibitor Hall, MACUL14 continued to amaze, with EdTech rockstars presenting in seemingly every room. I had the pleasure of seeing such inspirational educators as Nicholas Provenzano a.k.a. @TheNerdyTeacher and George Couros (@gcouros). Both shared their passion and expertise on many topics, but the one I found most profound was their shared vision for the student voice. A common theme throughout MAUL14 was the emphasis on student’s being given the opportunity to speak, be heard and receive feedback. This can manifest in the form of a blog, an exhibit, Genius Hour or a host of other mediums. However, the important component is getting students to share their developing knowledge and unbridled creativity with the world outside of their classroom walls. I am excited to use MACUL14 as my motivation to provide this opportunity to my students, and in turn, share my experiences too. This is beginning in the form of a Genius Hour (20% time) that will begin next week for my students, and I am sure it will grow, change and evolve in ways I cannot yet see. Regardless of where it goes, I will make sure that as a class, we share our adventure. Thanks to all of the amazing educators that I was able to connect with at MACUL14, and for sharing your knowledge, time, expertise and visions with me. I look forward to doing it all again next year.